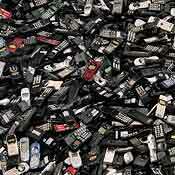 Do you have a drawer full of old cellphones, inkjet cartridges and good intentions? Now the Post Office is providing free envelopes for sending away your old gadgets to a recycler – without having to pay for postage! Launched in 1,500 Post Offices located in Chicago, Los Angeles, San Diego, and Washington, D.C., the new “Mail Back” program sends your electronic junk to Clover Technologies Group, an Illinois company that recycles the bits into new bytes. If the electronic item or cartridges cannot be refurbished and resold, its component parts are reused, or the parts are broken down further and the materials are recycled. Clover has a “zero waste to landfill” policy doing everything it can to avoid contributing any materials to the nation’s landfills. The free, postage-paid Mail Back envelopes can be found on display in Post Office lobbies. There is no limit to the number of envelopes customers may take. If the green postal program is successful, a nationwide rollout will be launched this fall. (Computer World’s Mike Elgan has the original) Thanks to Memetic Daybreak for the tip!